My earliest memory of an Allard was sitting in the cockpit of Fred Warner’s J2X (chassis #2192, now owned by David Mundy) as we loaded it onto the trailer to go to some race in 1954. The sound and vibrations of the open exhaust left a lasting impression in me. My father, Frank Burrell, often spoke about the incredible acceleration of the Allards with the Hydramatic transmissions. Zero to sixty in 4 ½ seconds in the early 50’s was quite impressive. How did this mechanical engineer from the University of Wisconsin end up working in Detroit on Allards? Let’s back track for a moment. Frank’s interest in cars began at an early age. He built his first “car” at age 13. He worked in a salvage yard to help fund his way through college, but also found time to race Model ‘T’ Fords on dirt tracks. He landed a job at Cadillac in 1942, where he worked in their dynamometer lab as a test engineer on the Cadillac military tank engines. During that time he worked under Harry Barr and Ed Cole, who are credited for developing the Cadillac OHV and Chevy “small block” V-8’s. Frank’s first assignment was to develop more horsepower for the Cadillac-powered tanks. To accomplish this, he designed a 2 x 2 intake manifold and high compression heads. In 1946, with the support of Cadillac management, he started making performance packages for the post-war Cadillacs. He also started working on the new OHV Cadillac engine that was being developed as a replacement for the flathead design. Sometime in the late 40’s, he designed and built a 2 x 2 intake manifold for the OHV engines. He began selling these on the open market in 1949, again with assistance from Cadillac. Concurrently, my father had developed a pair of test intake manifolds consisting of a 2x2 and a 5 carb design. Both of these would end up being used by Briggs Cunningham on the Pataut Pataud and LeMonstre cars entered in the 1950 LeMan’s race. It was at this race that he met Sydney Allard and Zora Arkus-Duntov. Cadillac’s Experimental Garage was conducting a lot of high performance engine development during this time period. Special grind roller cams by Dunn, and multi carb intakes by Detroit Racing Equipment were routinely being tested. Reports indicated 7,000 rpm capabilities. Remember we are talking 1950! Frank’s experience had elevated him to head of the Engineering Garage, and he became the official liaison to anyone using Cadillac engines for high performance use. Cadillac even published spec sheets for modifying Hydramatic transmissions and building high performance engines. Letters to Cadillac about using the new V-8’s would put many people in touch with my father. The list of people who corresponded with him included; A.E. Goldschmidt, Major Seddon, “Ted Tappet” (aka Phil Walters), Bill Frick, Reade Tilley, Tom Lush, Reg Canham, Frank Griswold, Zora Arkus-Duntov, Curtis LeMay and Sydney Allard. Frank was an organizing member of the Detroit Region SCCA, and that brought him in contact with Fred Wacker. 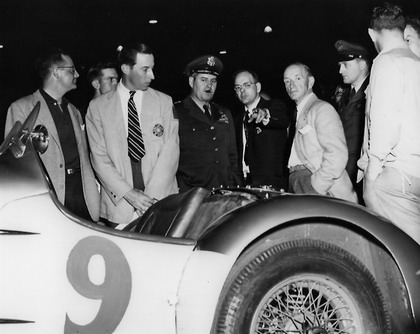 Fred had purchased his first Allard J2 # 1577 ( Emil Loeffler now owns), and he wanted to put a Cadillac engine in the car for the 1950 Watkins Glen race. My father modified the chassis to accept a hydramatic transmission and built up an engine using one of his own design aluminum intake manifolds. These transmissions were beefed up using tank internals, and they could be manually shifted. After finishing third at Watkins Glen, the car was refreshed and taken to Sebring for The Sam Collier Memorial Grand Prix of Endurance. There, the Wacker & Burrell entry finished 2 laps ahead of the rest of the field, and finished 8th overall using an index of performance system of scoring. During the same time he was involved with Wacker’s J2, he was also working on Fred Warner’s J2X. Fred Warner was a pilot for GM and a “car guy” who’s Allard was being used as a test bed to prove out the engine and transmission modifications that Cadillac was promoting. Weekends were spent traveling to the major races across the USA to assist the Cadillac-powered Allards. Click here to view the modifications available to transform your Cadillac engine in 1953. Frank worked closely with General Curtis LeMay’s group. As a reward for supplying Sydney Allard with the engines and transmissions he used in the new JR’s, LeMay invited Frank to attend the 1953 LeMans race as his guest. While he was there, he filmed the new Allard JR. Click here to view an invitation from the SAC. My father stayed at this position with Cadillac until 1955, when he left to work with Zora Arkus-Duntov at Chevrolet Research and Development. He worked there for 20 years until his retirement from GM. Unfortunately for us all, he passed away in 1985. Hopefully, I have been able to give you some insight into my father’s experiences with the Allards.